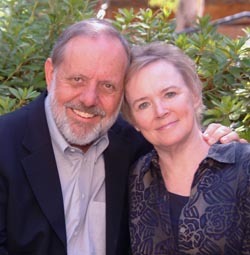 Elizabeth and Robert Bjork are leaders in research on human memory, award-winning teachers and advisors, and world-class citizens in their Department, University, and the field at large. Their research is best known for having changed our perception of forgetting from an unfortunate tendency of a limited system to the necessary consequence of an adaptive one. Together, they have published hundreds of papers on this and related topics, and have helped set the agenda for behavioral memory research over the last four decades. Both Elizabeth and Bob are great stewards of the discipline of psychological science, both at UCLA and in the field at large. This commitment to advancing the field is recognized in their numerous honors for service and teaching, including the Distinguished Service to Psychological Science Award from the American Psychological Association (APA). At UCLA, Bob has been Chair of the Department of Psychology, and Elizabeth has been Chair of the Academic Senate, the Undergraduate Council, and is currently Senior Vice Chair of the Department of Psychology after earlier serving as Vice-Chair for Undergraduate Studies. Bob has been Editor of the Psychological Review and Memory & Cognition, co-founding-editor (with Steve Ceci) of Psychological Science in the Public Interest, and President of the Association for Psychological Science, President of the Western Psychological Association, Chair of the Psychonomic Society, Chair of the Society of Experimental Psychologists, Chair of the Council of Editors of the American Psychological Association (APA), and Chair of the Council of Graduate Departments of Psychology. They have both won the UCLA Distinguished Teaching Award and Bob has been recognized with both the Distinguished Scientist Lecturer Award from APA and the Claude Bernard Distinguished Lectureship Award from the American Physiological Society. Their most lasting contribution will probably reflect their longstanding commitment to keeping psychological science relevant for society, for working to deliver the products of our science to a larger audience, and for doing so without compromising a commitment to basic, fundamental research. They continue this work with a large collaborative grant from the James S. McDonnell Foundation that they currently share with other major researchers on applying basic principles of learning and remembering to situations relevant to educational practice. For those of us who have been lucky enough to spend portions of our lives and careers with Elizabeth and Bob, we know as well what great role models they are as parents and working partners, as well as academics. Their many students and colleagues have learned much about science, life, and even golf from these two titans of learning and memory. * The FABBS Foundation would like to thank Dr. Aaron S. Benjamin and Dr. James R. Pomerantz for nominating Elizabeth and Robert Bjork for this honor and for leading the effort to spread the word about their nomination. Would you like to honor Elizabeth and Robert Bjork? It isn’t too late to have your name added to the list of donors! You can make your donation to this “In Honor Of…” campaign at anytime.